Download, add and edit subtitles with built-in subtitle tool. If language is unknown to you, reading subtitles help to understand. Increases reading capability (Helpful for those preparing for some competitive exams). Very helpful for deaf and dumb people. For linguistic person help in improving language/word knowledge. In fact, subtitles usability list goes on. So, how do you can stand behind from accessing this wonderful technology. Even you can have access to download movies with English subtitles easily with following top 3 methods, these subtitle downloader for movies will help you to get the subtitle of the video track that you wish to watch as well understand them. 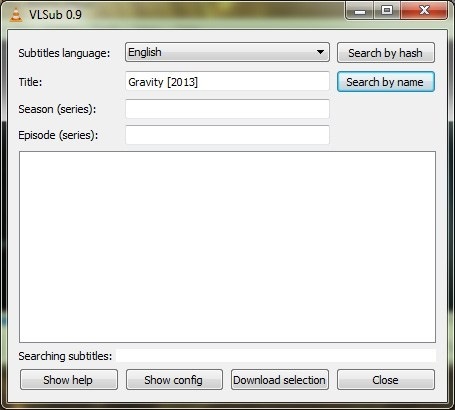 So, without causing any delay lets learn how to download subtitle file in next part. If you really believe in perfection then this part will deal with all those things which make subtitle downloading experience quite exciting as well as easy going, that start with Wondershare video converter ultimate tool, that use to provide you with all the necessary tools that will assist you on the journey of downloading the subtitle for your favourite video tracks with advanced technology yet great easiness. Launch Wondershare Subtitle Tool, click Add Files to import your video file that requires subtitle. Then click Crop or Effect icon below the loaded video thumbnail, you'd get a video editing window and switch to Subtitle tab just as the screenshot shows. Under the Subtitle section directly click on the search icon. A new window will pop up allowing you to search the video subtitle by entering the video keyword, click Search and you will see a list of subtitles, select one that matches the searching result and download it to PC. If you wish to customize the subtitle then below the search option of the tool, you can go for editing task such as changing the font, color, style, positioning, size as per the requirement and press OK to apply the changes. Lastly, there is a bonus to you in terms of saving the file in the desired format. 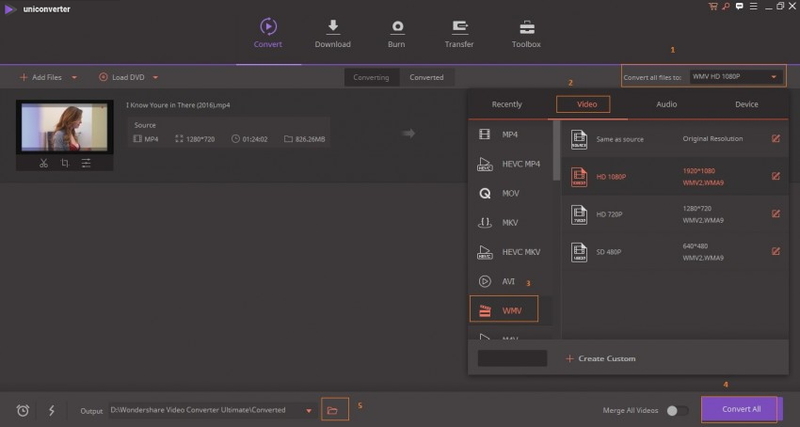 For that go to Convert all files to: > Video > select desired format say WMV > and Convert All. And you will have your files gets saved in the output folder, you can easily access them by clicking the folder icon from interface bottom. Folder icon is marked as number 5 in the above-mentioned screenshot. Here in this part, we are dealing with Youtube SRT downloader through online mode. Especially for those who do not wish to download any software on their system, as well looking for free subtitles download for movies. The online tool is quite handy to use and can be accessed from anywhere. Below we have given the process that will guide you to download video subtitle online. 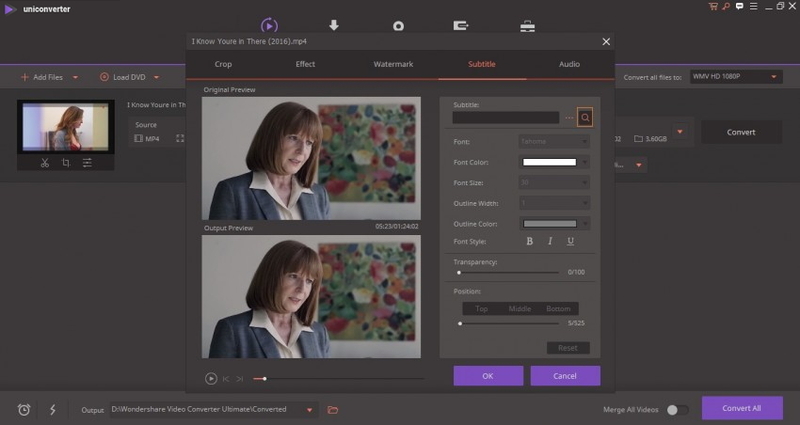 With this online tool you can get subtitles as a free download through following method, the detailed steps are as follows. Step 1. First of all, go to the online subtitle site. Note that before starting, you need to get the video copy ready with you. Step 2. Now, you can see the main page of easysubtitles. Drag and drop your target video file to the webpage and a loading sign will appear. And within a second it will show you subtitle download link, select one based on language option (for example you can choose subtitle in the English language) and then click on the link to download it. That’s it. Doing above process will enable you to go for download subtitles online easily and comfortably as per own convenience. The process is quite simple and fast that soon you would be able to watch the video with its subtitle. So, just go and have this quick tool. The VLC media player is the name needs no introduction. Quite famous among desktop, PC, tabloid or other device users for media paying purpose. Well besides that it also holds many hidden features, such as Subtitle downloading capacity. Step 1. Download VLSub extension on the PC, you'll get a compressed file, extract it, doing so will get a file named as vlsub.lua extension. You need to copy this extension file and visit the location: C:Program Files (x86)/VideoLAN/VLC/lua there create a folder (named it as extensions) and paste the file. Step 2. 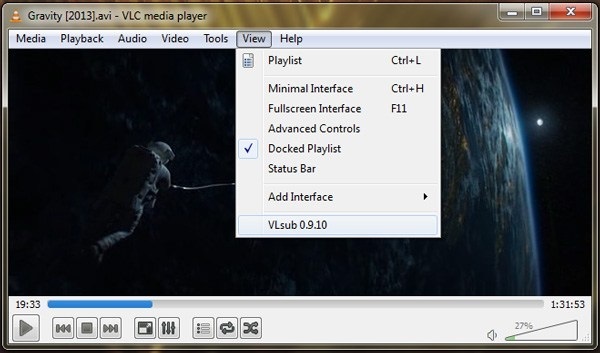 Now launch VLC player > open view menu > at the end you will find the VLSub option. Step 3. Next step is to play your video in VLC player. Go to View Menu to click on VLsub option and you'll a pop-up window, search the related video subtitle. Step 4. You will get a list of related subtitles, select the required one and press Download selection option. Here, using VLC for English subtitles download as well subtitle for other languages becomes possible. In short, below is a brief comparison among 3 solutions on how to download subtitles processes. Wondershare tool for srt download gives you a comprehensive guide for downloading, editing as well as other video editing related tasks. Easysubtitles Youtube srt downloader online gives you the option to go for downloading subtitles without going for any desktop version or tool. The third one the VLC player, most of the users has access to it. You can use this tool get the favorite srt file download after installing the VLsub extension. Now, at the end most important question which one to choose to download sub from youtube, well you are free to make your choice as per the requirement. But if you want my view then as per the above comparison found that the built-in subtitle downloader of Wondershare VCU is the most recommended one due to its versatile subtitle downloading, editing as well other video conversion facilities make it the first choice than others.